Two years ago today we held you in our arms having no idea what it really meant to be parents. Two years ago today we counted your fingers and toes and were awed by the blessing and responsibility that God had given us. Two years ago today we looked into your eyes and dreamed of the things God has planned for your life. Two years ago today we fell in love with you. These last two years you have brought us tears, fears, and headaches, but more than anything you’ve brought us untold joy. We thank God for you, our little bit of girl, and we celebrate your life today and everyday. When I published last Wednesday’s post I had no intention of it being the last thing I wrote for a week. In fact, I was planning another post in my head, but like so many things, blogging got pushed to the side when we went from “getting enough sleep to function” to “getting enough sleep to survive” around here. Boo has never been a great sleeper, but we’ve managed. 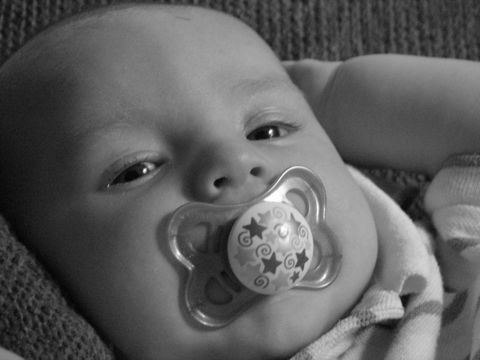 For the last several weeks, Matt and I would get up probably a half dozen times a night (on average) to give his paci back or in some way soothe him back to sleep (he was down to one feeding per night). Then last week, he decided that he needed to be awake and screaming a couple of nights and the other nights he just wouldn’t stay asleep. It seems that the doctor’s recommendations for treating his reflux just aren’t cutting it. After hitting bottom on Wednesday night (and two terrible days on Tuesday and Thursday), I figured it was time to call the doc and see what our next step should be. As of today, my baby boy will be taking prescribed medication every day for the foreseeable future. I don’t feel real great about him going on a daily medication when he is so young, but the poor thing is obviously in pain and I don’t want him to be in pain. And so begins our new adventure…trying to get a three month old who has never had a bottle to take 4 ounces of water with the medication dissolved in it twice a day. We’re hoping and praying that this will work and our sweet boy will find some relief, and, in turn, we’ll find some sleep. All of that to say I’m back (for now at least) and looking forward to catching up with everyone. Last week I mentioned that my friend, L, and I were embarking on a 15 week better health and weight loss challenge. Today marks the end of the first week, so here is a quick check-in. This weekend was a bit rough because I felt so bad, but overall I had a good pretty good week. I owe $3 to the penalty jar for breaking my “rules”; I had more than one sugary drink on three days. However, my weigh-in and measurement check today was encouraging. I’ve lost two pounds and an inch off my measurements! That’s enough to keep me motivated for a few more days. Yeah, that’s how I spent my weekend. Hope yours was better! After Little was born I dropped weight like crazy. I was four pounds below my pre-pregnancy weight at my six-weeks check up and lost an additional 20 pounds by the time she weaned. Not so with Boo. I lost the first 20 pounds of my pregnancy weight quickly, but these last 8 or 10 are lingering longer than I would like. So, my good friend L and I have decided to challenge ourselves to eat better, exercise more consistently, and hopefully drop a few pounds. We’ve laid out some rules and set some goals and for the next 15 weeks we’re going to get down to the business of getting back in shape. Right now we’re pretty motivated, but as we get a few weeks in I suspect we’ll do a little back-sliding, feel a little unmotivated, and have a desire to just call the whole thing off. That’s why we’re doing this together; we’ll have someone else to encourage, motivate, and hold us accountable when those temptations come along. We’ve also set up a “punishment” fine of a dollar for rule breaking; if we can’t motivate ourselves, maybe the bank can. And in the end, when goals are met, we’ll reward ourselves with a nice evening out. With no kids! Here are our rules: eat three balanced meals a day and allow for two healthy snacks (gotta have plenty of food for this nursing Momma), no eating after 7:00pm, increase water intake while decreasing sugary drinks, exercise at least 5 days per week, and a couple others that are specific to our personal goals. I may throw in a couple of other non-health related goals as I go along as well. It should be an interesting 15 weeks (especially since our vacation falls in here). I’ll keep you posted. It is hard to believe that Boo is already three months old! He is such a sweet boy (well, maybe not when he’s screaming at 4 in the morning, but most of the time) and has a very pleasant disposition. He coos and babbles and smiles much more readily than his sister did at this age. We think he will be our social child. You are currently browsing the Sidetrack'd weblog archives for July 2008.